Thanks to our awesome sponsors and supporters! Hill's provide all of the food for the animals in our shelter. Good nutrition is paramount to the health and well-being of our beloved pets, and contributes to their longevity and happiness. Hill's high-quality, balanced ingredients are formulated by vets, nutritionists and food scientists, so we are confident in recommending their products for you pets. These guys are THE business! The Island’s Computer Guys provide professional and affordable computer repair services, printer installations, small wireless network set-ups, website design and more, right here on the island. In addition they find the time to fund ALL of our advertising in the Gulf News, which is amazing. 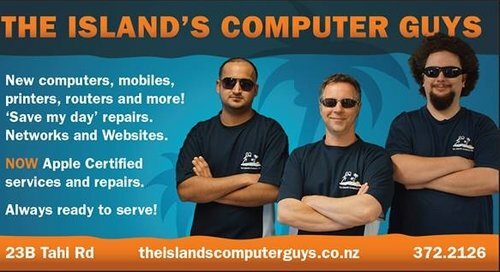 So, to CTRL, ALT & DEL all of the PC problems in your life - contact The Island's Computer Guys today! Finally, a one-stop shop on Waiheke for all your pet supply needs! Pet Connect NZ connects you with unique, quality pet products. They focus on stocking Kiwi products, and only the best brands from overseas. If you want to shop from a selection of handmade, natural and stylish products, check out their website today. They love working closely with their favourite animal charities (like WISCA!) and make it easy to donate while you shop. Waiheke customers - avoid the shipping costs and pick up your next order at WISCA! Just select the ”Click and Collect” option at checkout. The New Zealand Companion Animal Council is instrumental in the success we have in reuniting missing island animals with their concerned pet parents. With NZAC’s sponsorship of 100 free microchips and registrations, we reunited more pets in 2018 year than we adopted out. As microchipping is becoming more commonplace, and in the case of dogs, a legal requirement, NZCAC have established a lost pet register. This operates 24/7 through both its website, and its 0800 LOST PET register phone line.